Since 2009, Hanes has made donations totaling $1 million dollars towards breast cancer charities. Join them this October as they raise awareness and money (up to $25,000) for The National Breast Cancer Foundation through a social media campaign on Facebook. Now, when you Like Hanes on Facebook, you can follow the Pink tab on their lefthand sidebar to create and send a Virtual Comfort Package. Using their digital tools, these comfort packages include customizable photos, videos, recipes, T-Shirt designs, music and messages. 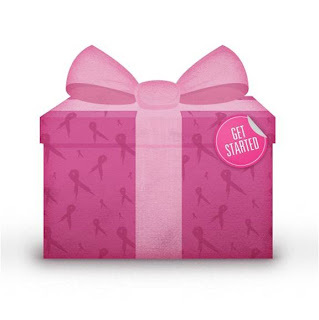 The Virtual Comfort Packages are FREE to send, and for each package sent Hanes will donate $1 to The National Breast Cancer Foundation, Inc. The money will be used to promote early cancer detection and to pay for mammograms to those in need. Hanes will donate up to $25,000 in this campaign. I am personally really excited about this campaign. We know the other initiatives that have been taking place on Facebook to raise awareness to breast cancer - the little games of listing the color of your bra, etc. Though fun and quirky, at the end of the day these games are nothing more than status fillers on Facebook. The participants walk away not knowing anything more than they already did about breast cancer, and they haven't done anything real to help the cause. Other ways to help spread Breast Cancer Awareness with Hanes on Facebook this month include writing on the Words of Comfort Wall and sharing a message of hope with the world, or a personal story that might help others relate to the situation. Also, when you design and buy a T-Shirt at HanesPink.com this month, 10% of the proceeds will benefit The National Breast Cancer Foundation, Inc.
Take strides and make a real difference this month in the fight against breast cancer! Disclaimer: This post is through a campaign with my membership in the One2One Network, and I am eligible to win a prize. All opinions in the above post are my own, and may differ from yours.